25-Jan-2002 -- In the middle of an interesting wilderness portion of Santa Cruz's De la Vega park is the confluence that many others have visited before I got there. This is one of those places where I knew it was there a long time ago, but never had bothered to go and check out the site. Yesterday I headed out that direction to hit a geocache that was nearby and hopefully to plant one at the confluence point. If you arn't familure with geocaching then check out www.geocaching.com or http://www.geocaching.com/seek/cache_details.asp?ID=13567 for a direct link to the "SCZ/DCP." I took a few photos and placed the geocache as close to the actual confluence as possible (plus or minus 2 meters). :~) Hopefully now that there is a geocache there we'll see some more logs appearing for this great confluence. 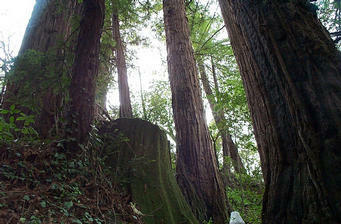 #1: Confluence next to a small group of Redwoods. #2: Readout of the GPSR on the hillside tral. #3: The trail that goes through the confluence just below the service road.